Dalhousie University Food Services began to track plate waste at Howe Hall in October 2018, as a part of Canada’s Waste Reduction Week, an annual program that encourages people to lower consumption, change behaviour and learn about their impact on the planet. On Friday of Waste Reduction Week, the focus was specifically on food waste and the issues with it. Howe Dining Hall serves the largest residence on Dalhousie campus, serving roughly 700 students. Its buffet-style dining allows students access to all food served. Dalhousie University Food Services declined a request for an interview for this story. 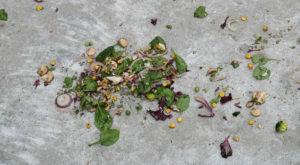 Each year Canada wastes $31 billion in food waste — equivalent to 40 per cent of the food produced in Canada annually. Canadians waste 183 kilograms of solid food per person, per year, equivalent to more than 6 million tonnes. This has the same environmental impact as having six million cars on the road. Food that ends up in landfills produces methane — a powerful greenhouse gas, that greatly contributes to the problem of climate change. Hannah Chadwick, first-year resident in Howe Hall, said the posters in the cafeteria raising awareness about food waste are effective, but she thinks most people don’t acknowledge the impact of food waste during their meals. “I don’t think about wasted food when I am choosing what to eat but I think about it as I am throwing it out,” said Chadwick. Kaylee Fox, a first-year Howe Hall resident, said the initial sign they posted made her more conscientious. However, she said meal hall doesn’t always update the sign daily or for every meal. Bruce McAdams, food waste expert and assistant professor at Guelph University, identifies Howe Hall’s initiative to track waste as a sort of intervention to show the world they’re doing something and not nothing. “It’s good and it can work a little bit, but it doesn’t solve the root causes of food waste,” said McAdams. Today, food is cheap and abundant, but it wasn’t always that way, said McAdams. Over time our relationship with food, and the degree of our access has changed. A study in retirement living communities by McAdams found they had upsetting and guilt-inducing feelings when witnessing food waste, as many grew up in a time of food insecurity. Respondents recalled economic usage of food and minimizing waste a priority, portion sizes were different and meals were simpler. McAdams said, they also considered food waste sinful and criminal, that living through a time of food scarcity led to their appreciation of food. McAdams said, about 30 years ago, North Americans started associating portion size with value. “That’s a big problem in our society for two reasons. We create more waste, but we also eat more,” said McAdams. He also said, the foodservice industry has commercialized endless options, contributing to indecisive tendencies and has catered to the consumer not wanting to eat leftovers. On Jan. 24, one Howe Hall student grabbed two garlic fingers, a scoop of mashed potatoes, steamed vegetables, one chicken burger, an egg and a side of salad. He also took one glass of chocolate milk, one mountain dew and a water. By the end of the meal, less than half his plate has been consumed. After scraping half a chicken burger, a dollop of potatoes, the crusts of the garlic fingers and some salad that’s absorbed the juices into the bin, they place their dishes in the labelled bins and exit the cafeteria. However, there are other ways to address leftover food, said McAdams. Students who are concerned about the amount of food waste they are producing should think about what they are putting on their plate and not be afraid to take small portions and go for seconds if needed.